The Cloistered Heart: Can I be a Sanctuary Light? For years, I have tried to embrace a little hidden 'apostolate' of being a sanctuary light in the midst of the world. To me, this is a natural extension of life as a cloistered heart. I can go through my days gently pointing to Jesus, for He is present always and ever deserving of love. This is generally a quiet 'activity.' After all, a sanctuary light does not draw attention to itself. It simply stands for and alongside Christ, and in His presence it glows. 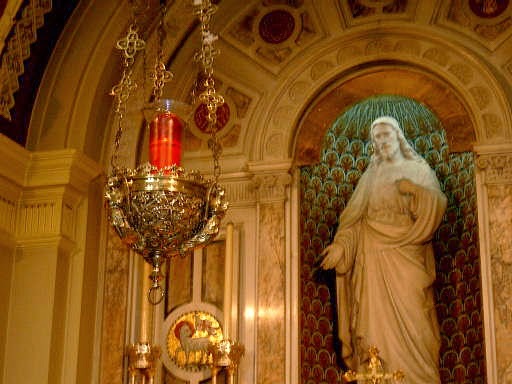 If we go into a Catholic Church, we recognize Our Lord's Eucharistic presence when we see the candle lit. It is a signal to us, a sign that He is truly there. There are no arrows pointing, no signs flashing. But we know. Some, of course, have never been told that a lighted sanctuary lamp means the Blessed Sacrament is present. Yet, even those who do not know the reason for the candle often grow quiet and reflective in its gentle glow. Some years ago, friends and I were discussing ways in which we could call attention to the fact that Jesus is present. We can do this in our churches, because sometimes even there His presence is overlooked. Our very movements call attention to Him when we genuflect, silence our voices, show reverence, kneel. As we then go forth into the world, we are privileged to do so with Jesus in our hearts. We carry Christ within and we meet Him in others Oh, how easy it is to forget this truth. And if we forget it, others do as well. What is the job of a sanctuary lamp? To never leave Our Lord's side. To be steadfast and faithful, standing for Jesus through good times and bad. To follow Matthew 5, allowing our good acts to draw others to praise God. To remain aware of Him no matter where we are, no matter what we're doing. To stand in Christ's presence and let the whole world see us glow. Beautiful- thank you for this! And I thank you so much for commenting! What a beautiful reflection. I miss the old churches, with the tabernacle behind the altar and the sanctuary light burning. Oh, I miss them too.. so much that it can literally hurt. So inspiring!!! Thank you !!! Oh my adorable Jesus, may I always burn in Your Presence! Make my heart a little lamp, filled with the oil of Your Spirit..ablaze with ardent love and desire for You..and You alone!